We are always happy to take your orders over the phone but most of our customers enjoy the convenience of placing their coffee orders online. Place your order anytime, 24/7. 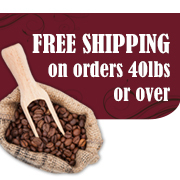 We'll create your custom re-ordering page that includes coffees you order most frequently. 2% savings on every order. Please email your sales representative: Meghan Kurz and let her know your interest in setting up an online ordering account in your company name. Custom pages are also available to make re-ordering quicker.